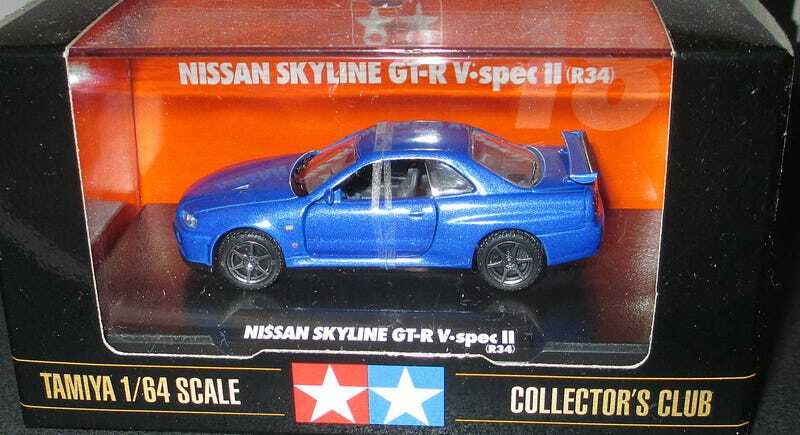 Tamiya is better known for their model kits than 1/64 scale diecast models. But they do exist, if only by mail order from Japan. These aren’t even listed on their website, so I am not sure if they are still current. Probably not, which would be a shame. As you can see, the quality is really nice. The price I paid for it is on par with recent Tomica Limited Vintage and less than similar Kyosho models. Compared to these, the Tamiya has no obvious drawbacks, but a few advantages. If there is one thing I could criticize, it is that the paint could be a tiny bit thinner - it softens the lines a bit too much for my liking. But it’s really only a small gripe - the overall look is still stunning IMO. The tampos and lights took terrific - even the rear window wiper is lovingly executed. And that feeling of loving and careful execution of the whole model is what really wins me over. It’s more than I can say about some of the Kyosho models that I have. This Skyline definitely has the Godzilla stamp of approval!